Page Number: Begin the list on a new page and number each page, continuing the page numbers of the research paper. For example, if the text of your research paper ends on page 10, the works-cited list begins on page 11. The page number appears in the upper right-hand corner, half an inch from the top and flush with the right margin. Here are the basic MLA format templates if you would like to create the Works Cited list yourself (instead of using the automatic generators). A Work in an Anthology:Name of author inverted. “Title of work.” Title of Anthology. Ed. Editor’s first and last name. Place: Pub, Year. Pages of work. Printed. Peterson, Nancy J. “Toni Morrison: A Critical Look.” Toni Morrison: Critical and Theoretical Approaches. Ed. Nancy Peterson. Baltimore: Johns Hopkins UP, 1997. 221-76. Printed. Name of author inverted. Title of Play. Title of Textbook. Ed. editor’s name. Place: Pub, Year. Pages. Printed. Miller, Arthur. The Crucible. Elements of Literature. Fifth Course. Ed. Kathleen Daniel, et al. Austin: Holt, Rinehart and Winston, 2000. 829-887. Printed. Name of author inverted. “Article title.” Title. Edition. Date. Printed. Hernandez, Tomas. “Portugal.” The World Book. International ed. 1999. Printed. Title. Ed. Editor’s last name, first name. Place: Pub, Year. Printed. The New Jerusalem Bible. Ed. Henry Wansbrough. New York: Doubleday, 1985. Printed. Name of author inverted. “Title of article.” Name of periodical (omit any introductory a, an, or the) Volume number or issue number (Date of publication): Page numbers for the entire article. Printed. Beets, Nicholas. “Historical Actuality and Bodily Experience.” Humanitas 2.1 (1966): 15-28. Printed. Website:Name of author inverted. Full Title. Publisher, Publication date. Web. Access date. Class Notes:Name of lecturer inverted. Class Notes. Course. Location. Date of lecture. Lecture. Name of speaker inverted. “Title of Presentation.” Sponsoring Organization. Location. Date. Speech. Harris, Muriel. “Writing Labs: A Short History.” 2003 Writing Center Conference. National Writing Centers Association. La Swank Hotel, Seattle. 28 Mar. 2003. Speech. Sources come in many forms. As a general rule, arrange the information in your Works Cited in the following order:Author. Title. Place of publication. Publisher. Date and any information that could help with retrieval. Medium. I need to site three books by the same author. I finished MLA Works cited page on a website which my teacher gave me a 100 on. Hi Laquisha. Thanks for your input. I’m gonna have to agree to disagree. How Do I cite a photograph from an online magazine or publicity agency? 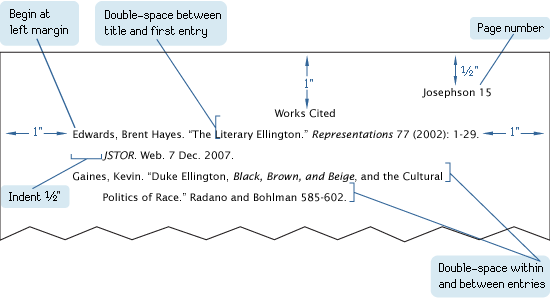 What should the in-text citation look like? How would one cite a video (on youtube) in MLA format? Would one just cite the website? Does the Works Cited page take the place of the Bibliography, or in MLA are both needed? Q: Does the Works Cited page take the place of the Bibliography in MLA? Hello, is it considered plagiarism if i took excerpts from various pages and mix them together, so the work will be more complete, and put the sources in cited works? or do i have to put also my words into the sentences? Yes, that is considered plagiarism. See citation examples here. This is good but it’s not really specific enough, like where it says name of author inverted it should be last name, first name. And it says location of publication when it should say city. How exactly do I use MLA format for a philosophy paper, the source I am using is from Stanford’s online encyclopedia, in which it’s a paper written by an author, but I don’t know exactly how to format it. My teacher had told our class to just put the author’s last name at the end of the sentence. That is called in-text citation, you can read some examples here. See under the section “Placement and Punctuation Rules”. Generally, you would put the last name and page number but since the source you use is online and has no page number, you just use the last name, as advised by your teacher. This article does not specify what goes first, second, third. e.g. author’s name, then title of source, then year, then page number, etc. So, if I direct a student here, he can get the correct format, but not the proper order of information. I would like to let you know that I have updated this page to include the information you suggested. The new information can be located under subtitle: “MLA Format Works Cited Templates”. Take care!